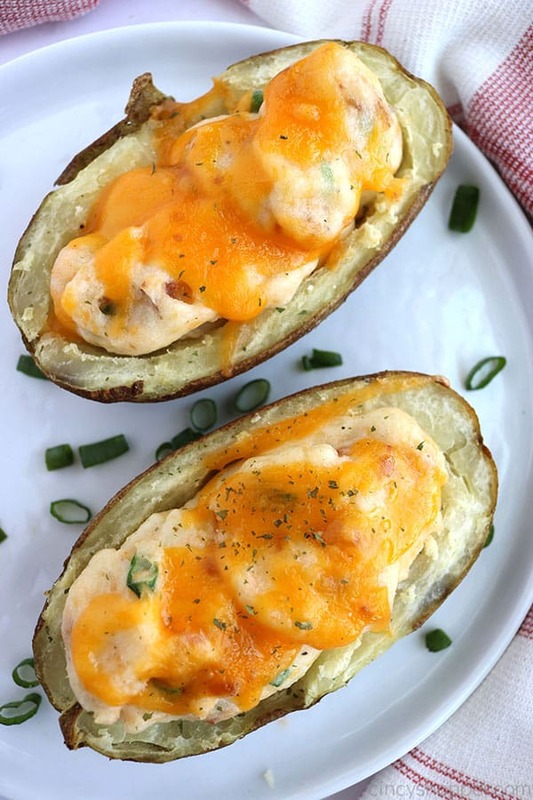 It’s so easy to make Twice Baked Potatoes at home. You will find creamy mashed potatoes with your favorite toppings loaded inside a crispy tater skin. Go ahead and serve them as a side dish, appetizer or even a meal. 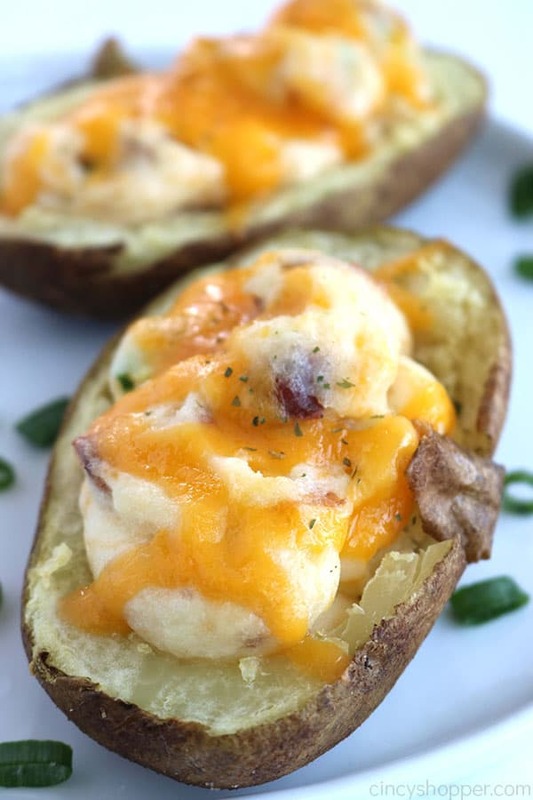 Sure Mashed Potatoes and Potato Skins are great but, with a bit more effort you can enjoy delicious Twice Baked Potatoes. Serve them alongside your favorite steak recipe or even Parmesan Crusted Chicken. I find them to be easy to make, versatile with many meals and great for preparing ahead of time. 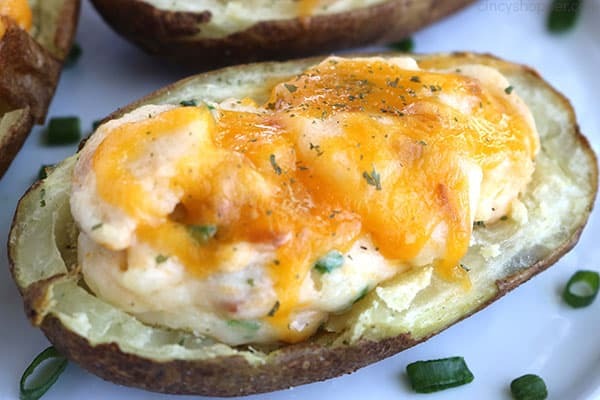 I make these Twice Baked Potatoes with cream cheese, butter, and just a little milk. Then I add my favorite toppings like bacon, cheese, and green onions. We have also tried them with broccoli and cheese, sour cream and chives which are great options too! If you should prefer no toppings at all, you will still find them flavorful. 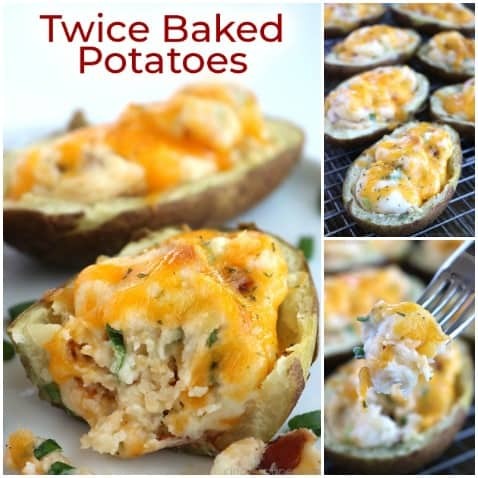 Twice Baked Potatoes get baked two times, hence their name. You will most likely see them on the menu at a fancy restaurant but, we can easily make our own homemade. The process is relatively simple. 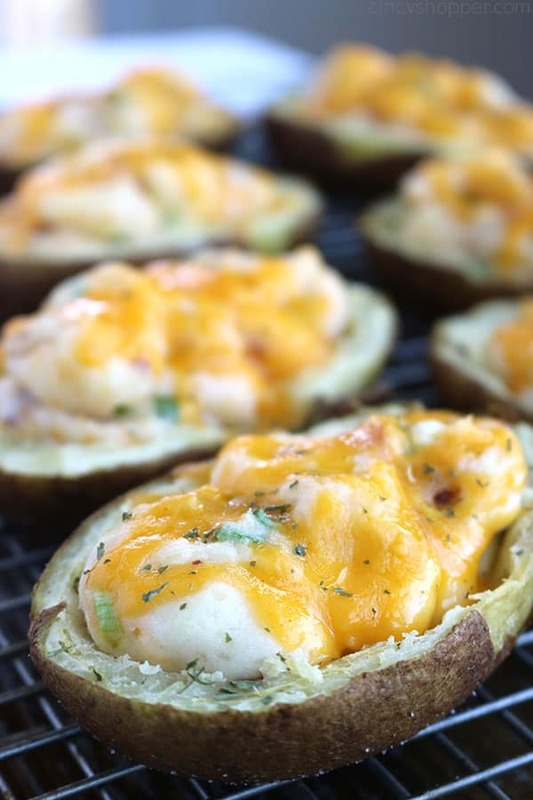 Twice Baked Potatoes are perfect for fancier meals or holiday dinners. Go ahead and make a large batch for serving a crowd. Consider making a few different variations to offer variety. 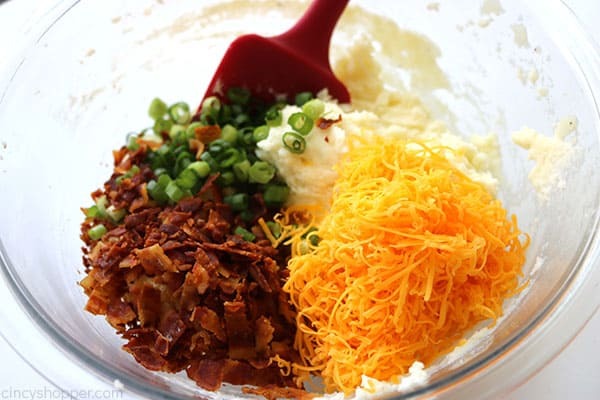 Favorite Potato Toppings like bacon, cheese green onions. First, wash and scrub the potatoes. Then stab them a few times with a fork. Next, drizzle each potato with olive oil to coat. Finally, give each a dash of salt and pepper. After adding the oil, salt, and pepper, rub them well. When baking it will allow the skin to become crisp. Next, the potatoes will go into the oven to bake for about 50 minutes. I remove them and allow to cool for about 5 minutes. 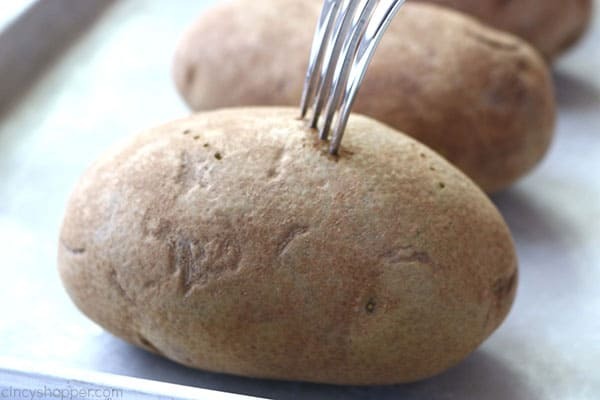 For the next step, I use a spoon to make a crease around the edges of the potato. 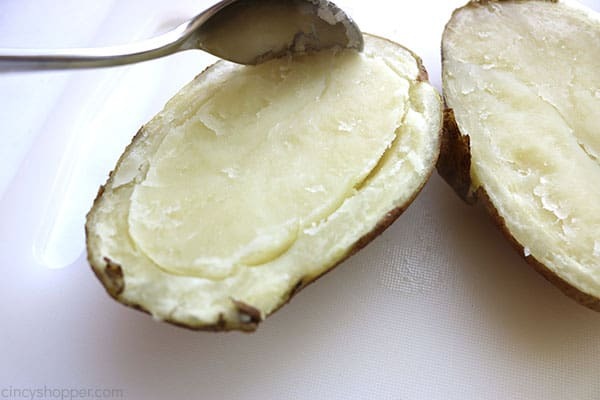 Then scoop all the potato leaving about a 1/4 ring. Just a little bit of shell is needed. 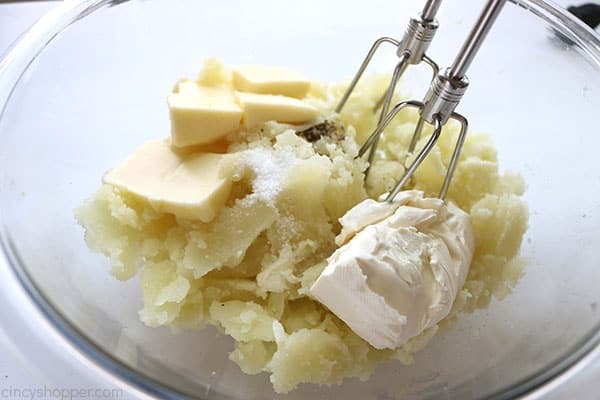 After placing the scooped out potatoes in a medium-sized bowl, I add the butter, cream cheese, salt, and pepper before mixing with my hand mixer. I am careful to not over mix the potatoes. 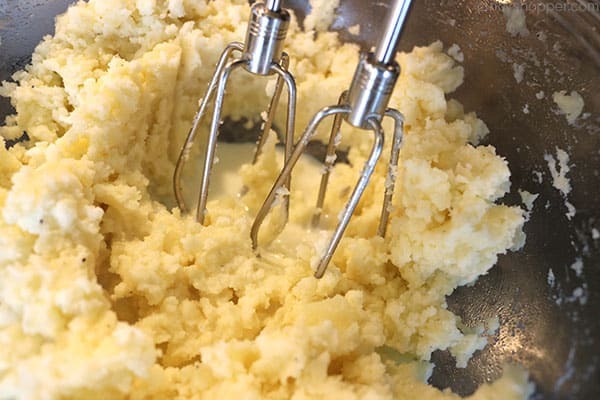 Then, I add milk and mix a little more to make the potatoes creamy. Then, it is time to fold in the mix-ins. For these Bacon and Cheese Twice Baked Potatoes, I used bacon, shredded cheddar cheese, and green onions. I find crisp bacon to be the best for this recipe. I finely shred the cheddar cheese. Prepacked store bought will be ok but will not result in the best flavor or texture. Evenly fill each skin. I sometimes use a zippered bag with the corner cut to make fancier looking potatoes. I usually top with a little more cheese before placing them back into the oven for an additional 10 minutes. You can use just about any variation of potato for this recipe. I find that large Russet baking potatoes work best. Add the milk gradually being careful of providing too much moisture. Do not over mix the potato mixture, or you will have gummy type filling. 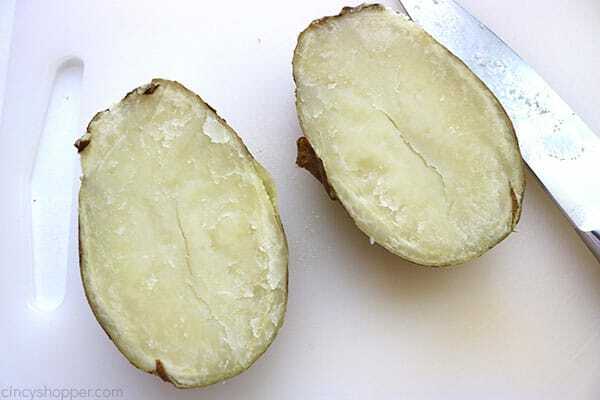 If you are looking to freeze the potatoes, there is no need to bake after filling. Go ahead and place them on the baking sheet, allow to cool then freeze. If you prefer, you can also put them in a zippered bag and store them that way as well. Scalloped Potatoes– These are perfect for everyday casserole or holiday meals. 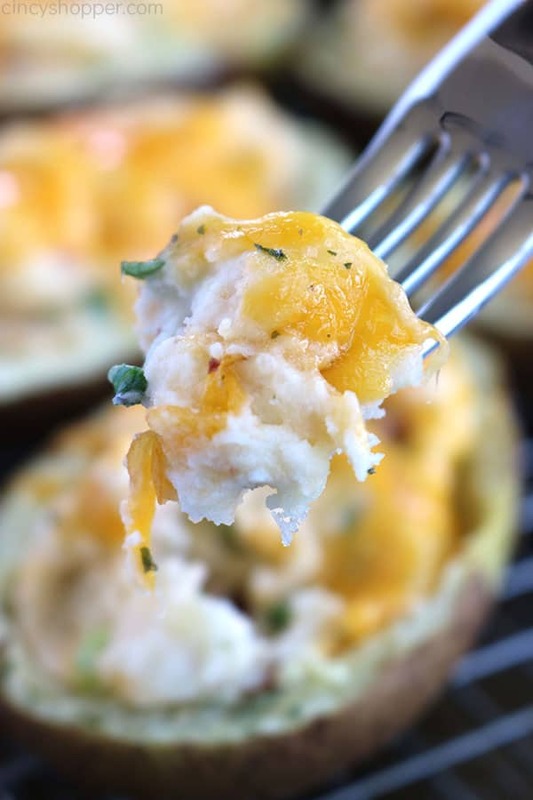 Garlic Smashed Potatoes – I like this simple recipe that can be made for a busy weeknight meal. 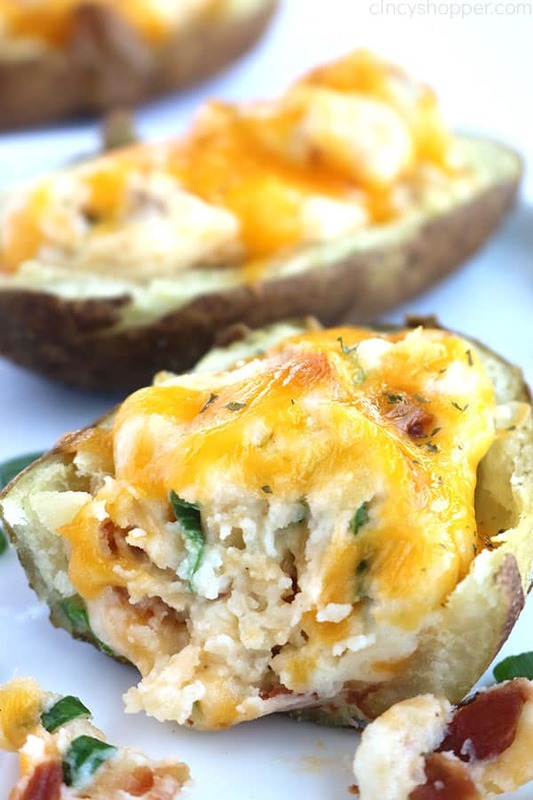 Instant Pot Baked Potatoes – This potato recipe is so quick to make. 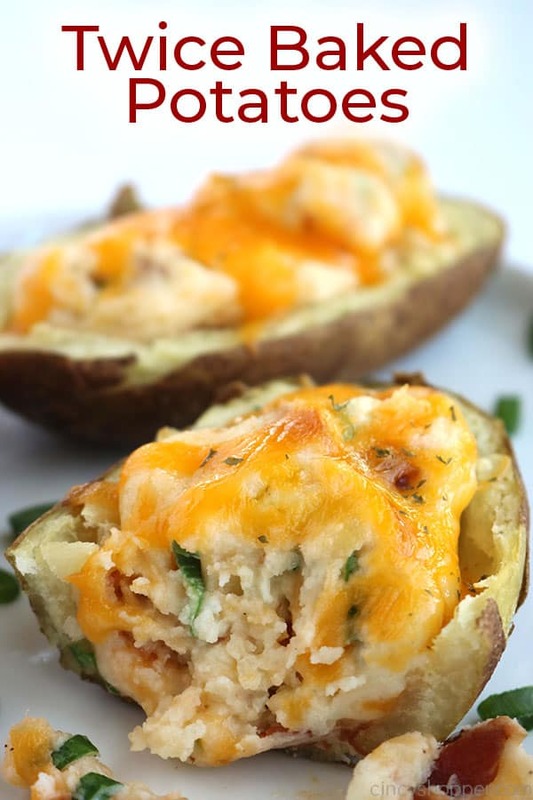 It's so easy to make Twice Baked Potatoes at home. You will find creamy mashed potatoes with your favorite toppings loaded inside a crispy tater skin. Go ahead and serve them as a side dish, appetizer or even a meal. Pierce each with a fork on all sides. Cut each potatoe in half lengthwise. Scoop out middle of potato leaving about 1/4" thick shell. 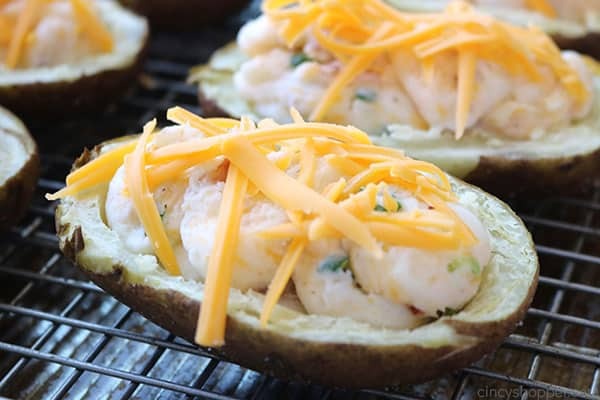 Place scooped potato centers along with butter and cream cheese in a large bowl. Add green onion, bacon and 3 1/2 oz of shredded cheese. Stir until well mixed. Use mixture to fill potato shells evenly and place on baking sheet with rack. Sprinkle remaining cheese on each potato. Hi Madeline! Wow! I accidentally typed sour cream, lol. I used cream cheese for this one. Sorry for the confusion. Thanks so much for catching that. Also, my schedule can be kind of crazy with all of these kiddos. Some days I balance my time well, others not so much, lol. Thanks for the nice comment, it means a lot (especially today).